Yesterday when picking Alexis up from daycare she immediately wanted to be held, burring her head into the crook of my neck. I felt the warmth radiating from her and just knew she had a fever. The thermometer at home confirmed: 102.4. She would be staying home today, even though her temperature was back down. Daycare rules. What ever was brewing last night seems to have blown over. She slept reasonably well, all things considered and her fever is gone. She’s energetic, and her usual happy self. The only indication that she may not be feeling well was a reduced appetite. She eat only a few bites of her morning cereal when she can normally eat a bowl and a half. A few hours later she was asking for gold fish like a champ. Since my little tropper seemed to be doing so much, but had to stay home anyway, I was looking for ways to make our impromptu Mommy and Me day a little more special. After all, big sister just had a bunch of them, and she got go to the movie theater! One of my ideas: Unicorn Sandwhiches. Sprinkles have about 2-3g of sugar per teaspoon, depending on the brand. A pinch can be estimated to be, what, a 1/16 a teaspoon? Not enough for the added sugar to disrupted a vulnerable stomach, but enough to add a bit of excitement. Alexis eat about 3/4ths of her sandwich. 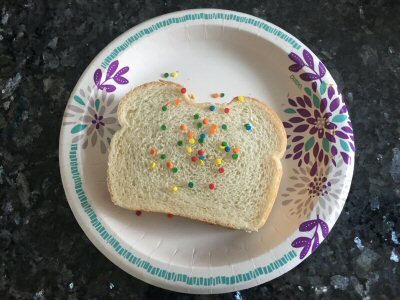 Not as much as I was expecting, but she loved the sprinkles and asked if we could have more Unicorn Sandwiches on the next home day.